Before installing (or even bringing) the wood flooring into the room, I inspect the subfloor to be certain it’s up to par. With board subflooring, check to be sure the board ends are fully supported on joists and are fastened with at least two 8d ring-shank or rosin-coated nails per joist. If it’s an old floor and the nails are loose, add more so the boards don’t move. At the ends, the boards might need to be predrilled so new nails don’t split them. Replace badly cracked boards, and set flush any fasten­ers that stick out of the subfloor. If you aren’t sure about the quality of a board subfloor—for example, if it is soft pine, runs perpen­dicular to the joists instead of at an angle, has more cracked boards than you care to replace, or has boards that don’t meet on joists—add a layer of underlayment plywood at least 3/8 in. thick over the subfloor. Plywood underlayment can reinforce a questionable subfloor and provides a smooth surface below finish flooring. Plywood at least 5/8 in. thick can also span small dips or low areas in the subfloor. Fasten underlayment panels on a 6-in.-minimum grid pattern. While you can use ring-shanked nails or staples for this, I prefer to use screws. Whatever fastener you use has to be long enough to penetrate the subfloor fully. I also use construction adhesive to ensure the best possible bond anytime I install subfloor. Try to avoid having underlayment panel edges land on the same joists where board ends meet. 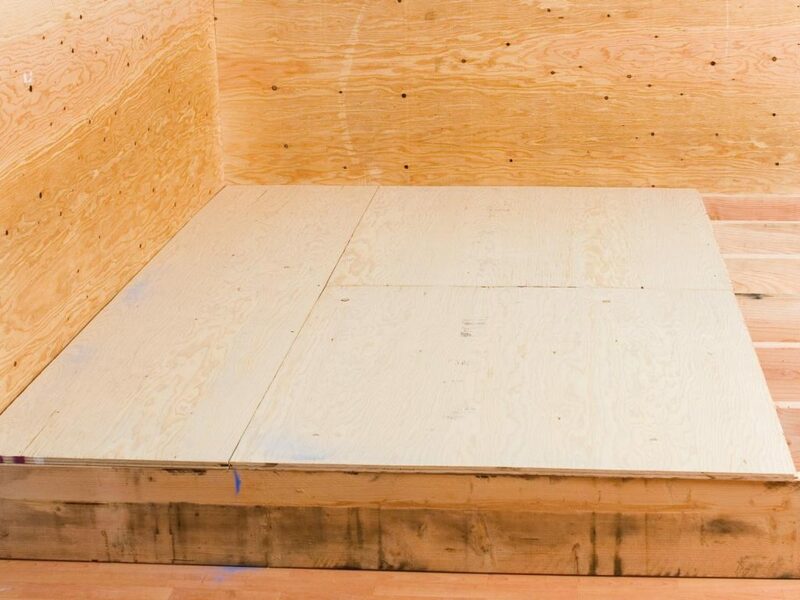 In the case of underlayment over plywood or OSB, the American Plywood Association recommends at least one joist bay between panel ends in the subfloor and underlayment. provide some room for movement, excessive moisture can buckle the edge of the panels. And if the panels are in contact with each other, any movement can cause squeaks. Plywood and OSB subfloors should be nailed or screwed every 6 in. where panel edges run along joists and every 12 in. on intermediate joists. It is good practice to glue down the subfloor with a H-in.-wide bead of construction adhesive on each joist.